It’s sooooooo quiet in my house with my two older hoodlums back in school. The baby and I can only sit and coo at each other for so long before we’re both bored to tears. (Side note: he started waving to me this week! Like all the time. So stinkin’ cute!) So yesterday I strapped the little dude in the Baby Bjorn and we got busy making these fast and easy treats. As krispie treats go, these are gourmet. Cut in big, thick squares they’re positively bakery-worthy. 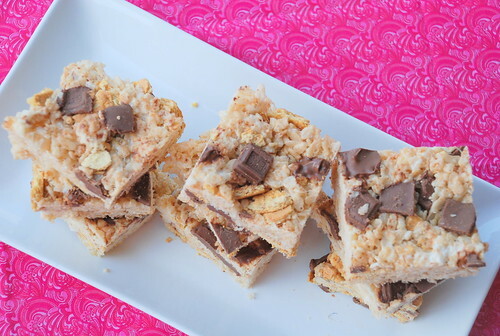 The trick to making these look as good as they taste is reserving some of the chopped Hershey bars and placing them on the top after the bars are pressed in the pan. That way you know these aren’t ordinary krispie treats. In a large, microwave-safe bowl, place the marshmallows, butter and vanilla in the microwave until the marshmallows begin to soften, about a minute. Mix with a spatula and microwave for another minute until the marshmallows are fully melted. 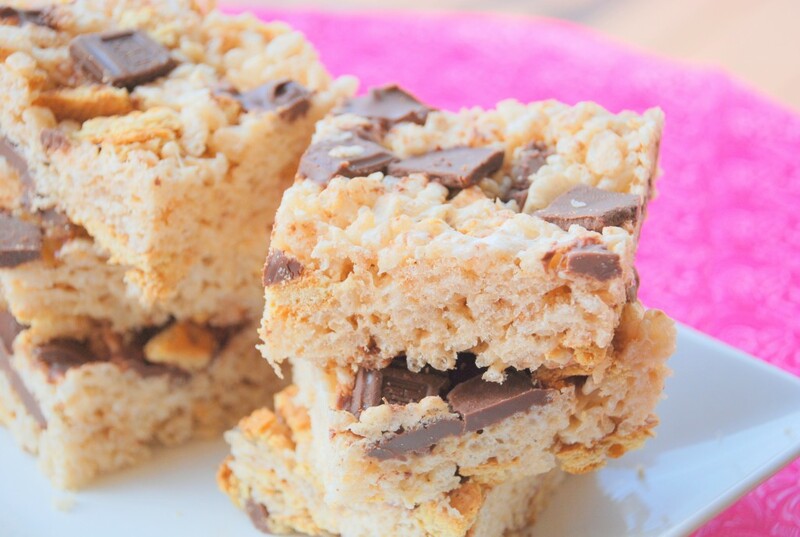 Add the rice krispies until just mixed together. Add the graham cracker chunks and half of the chopped chocolate to combine. Spray your hands with cooking spray and press mixture into the prepared pan. Press remaining chocolate pieces into the tops of the treats. Allow treats to set and DEVOUR!